“Travelling”… it sounds glamorous right?? 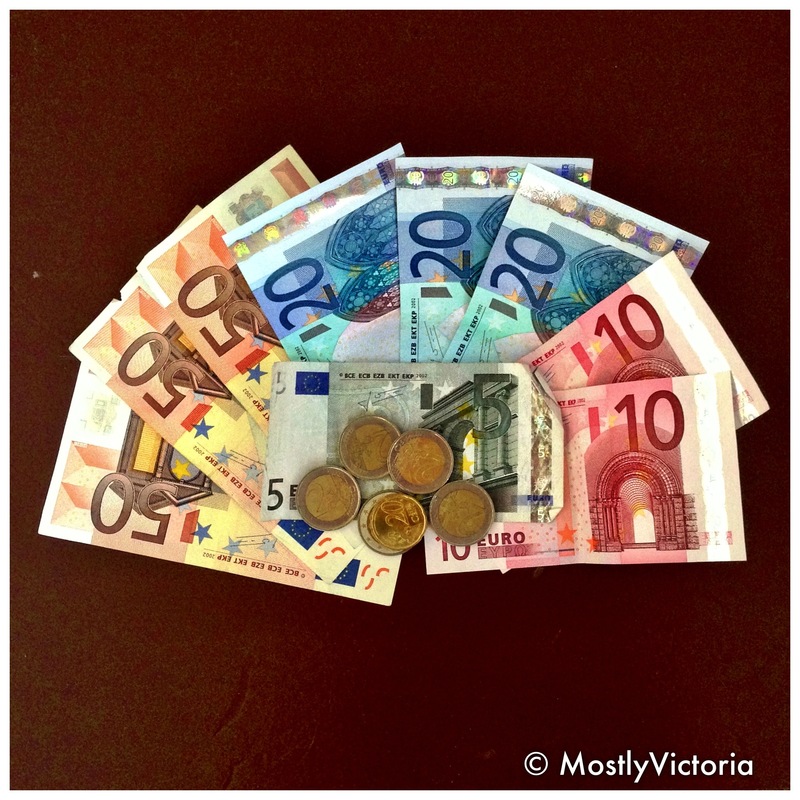 Yet for mid to long term travel it does involve some daily ‘chores’ – unless you have a bottomless pit of cash (alas we have don’t). But we do have a daily budget – its reasonably strict, but ultimately flexible, it has to be, at least a little. Keeping track of our expenses is just one of those little daily ‘chores’ necessary to ensure our pennies don’t run out before time off does. We know wheels are not entirely necessary & they are hardly indicative of being a ‘hardened backpacker’ – but we do miss (some) creature comforts. We are still adjusting to this new (albeit temporary) lifestyle. So we found a set of super budget-wheels at only 15 euros p/day – a bargain we thought? Sure… it’s far from the coolest ride, it does stall (often) and we may have to use 1st gear to climb any hill… but it was a steal and super-economical! We’ve clocked 350km this week on just 30 euro, which ‘mostlyhubby’ assures me is costing only 14 pence per mile (or 58 mpg) – on which basis we’re happy customers. Having collected our wheels, we drove long the coast back toward Zorbas hotel in Stavros, for our bargain ‘upgraded’ stay that we’d arranged last week. Thunderstorms were forecast and much as I loathe a storm – I knew our next stay was right on the beach & would provide us a front row seat – so I was thinking ‘awesome photo opportunity’. The skies slowly turned grey (as promised) and we got rain. Not long after the first few drops fell – our windscreen wiper broke. GREAT! before we knew it, the wiper was hanging off. After some almost evasive action, ‘mostlyhubby’ was to the rescue (in the rain) patching it back together. A little damper than before – he returns to the car and we continue. 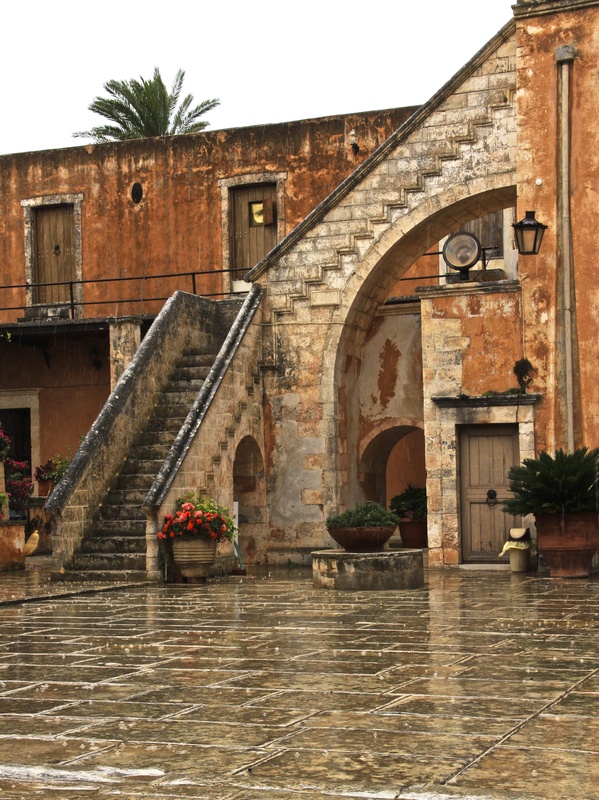 The rain was short-lived and as we headed out North onto the Akrotiri peninsula of Crete, via the pretty little town Souda with it’s military base and port, the skies began to clear. We never did see a bolt of lightening or hear even the tiniest rumble of thunder. I’m not sure if I was disappointed or relieved. A few villages and windy coastal road later, we stopped off for lunch at Kalathas – totally sucked in by the stunning, not to mention virtually empty, white sandy beach, complete with a lifeguard lookout that reminded me a little of ‘Baywatch’. I think the threat of a storms had put off the crowds, which of course pleased us. 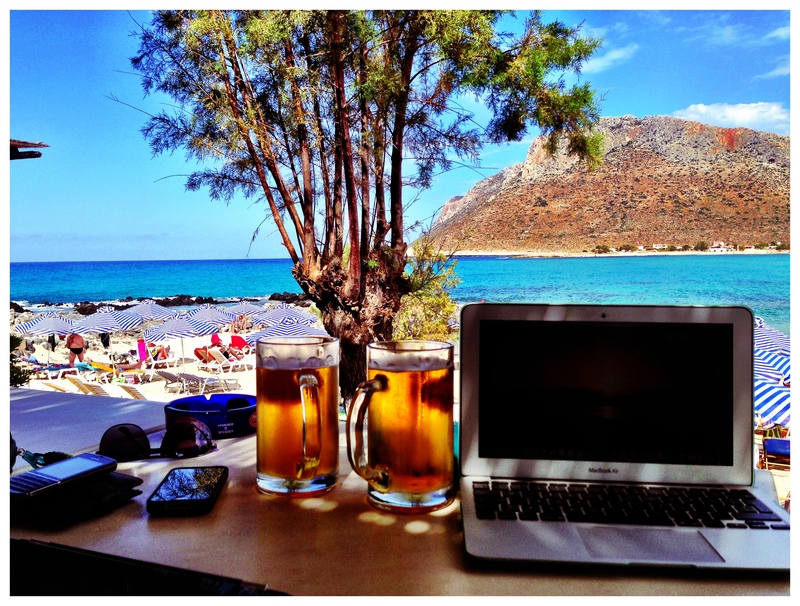 And it was here… at Kalathas Taverna… on the beach… that we tried our first Saganaki. Simply put; this is a fried slab of cheese. The verdict – salty, greasy, but satisfyingly naughty. *MVnote – eat your Saganaki before it cools down – else it becomes hard and rubbery and almost un-palletable. Later that evening, on the beach by Zorbas, we sat enjoying the last few drops of the evening sun & I noticed two young lads who had been snorkelling came ashore with a harpoon. So me being nosy/ inquisitive & always with camera at the ready, I went over to investigate. Turns out they’d quite a catch, various colours, shapes and sizes, explaining in their best English; ‘this one like veal’ (which confused me – isn’t veal meat?) ‘this one like lobster’. The rest they didn’t explain. I deduced this meant the ‘like veal’ and ‘like lobster’ must be the two they were most proud of. In return for their patience as I “papped” them, I took a photo on their camera and left them to it. The following day we took time to visit the nearby Gouverneto Monastery – y’know I had totally forgotten how much I love a monastery and it’s been a while since we last visited one. As we ambled over, it felt like we were about to enter a living-history, a place where time has very almost stood still for so years. To me, a monastery is quite unlike any other historical tourist site you visit; because it’s lived in – to the monks, it’s home! At the entrance, the monk gestured (without words) towards a basket. Eventually realising he was indicating that I should cover myself up, using one of the wrap around skirts they kept on standby. Unfortunately my cut-off (rather short) denim shorts were inappropriate attire. In my defence, our visit was a spontaneous stop on return from a quick trip to the super-market. On which subject – I think the Greeks need to reconsider their use of the word “super” in “super-market”. I’ve seen bigger village post-offices than some of the “super-markets” here. Not that I mind – we always find what we need, but still it makes me chuckle. I guess it’s lost in translation. I digress. 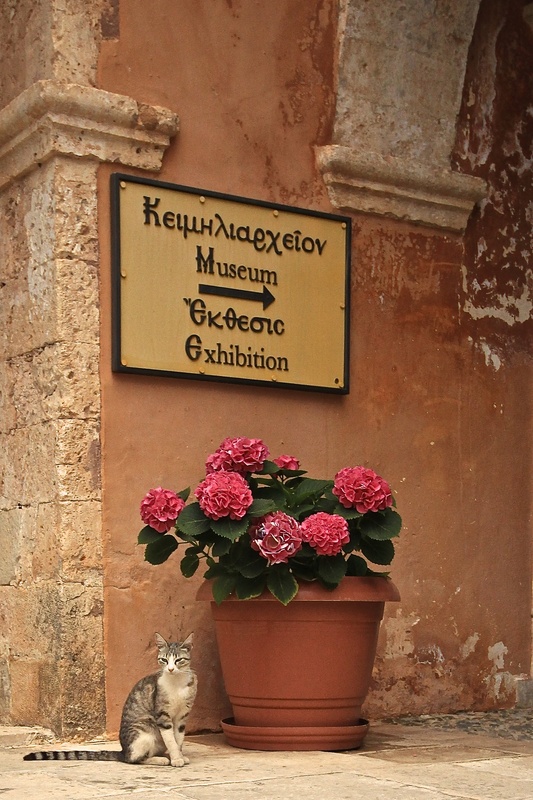 This endearing place (Gouverneto Monastery) was full of cats, taken in and cared for by the monks living there. 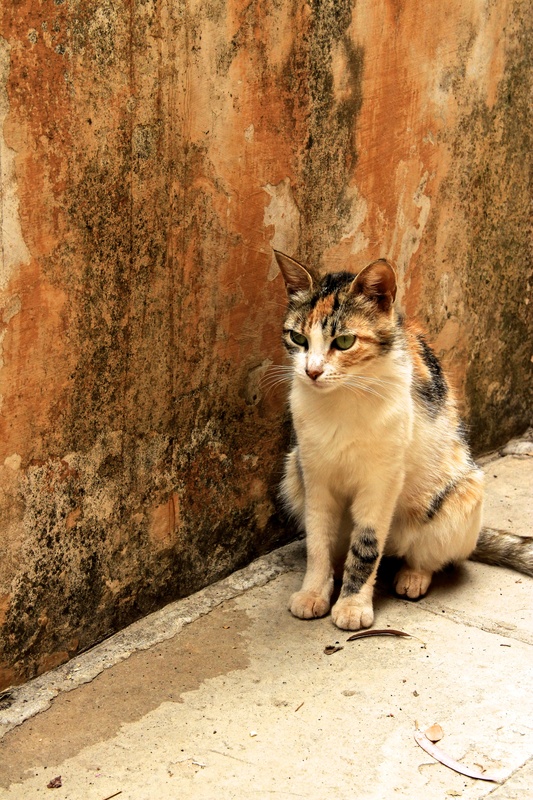 I found it has adorable character of shabby, yet so clearly loved and tended to. The external paintwork was cracked and peeling, the bricks were weathered, well of course they were this place is old! Sure, it looks tired and worn (which of course made for great photos and only added to the character and authenticity). In spite of all this, the flower pots and trailing plants scattered around the courtyard brightened it up no end. 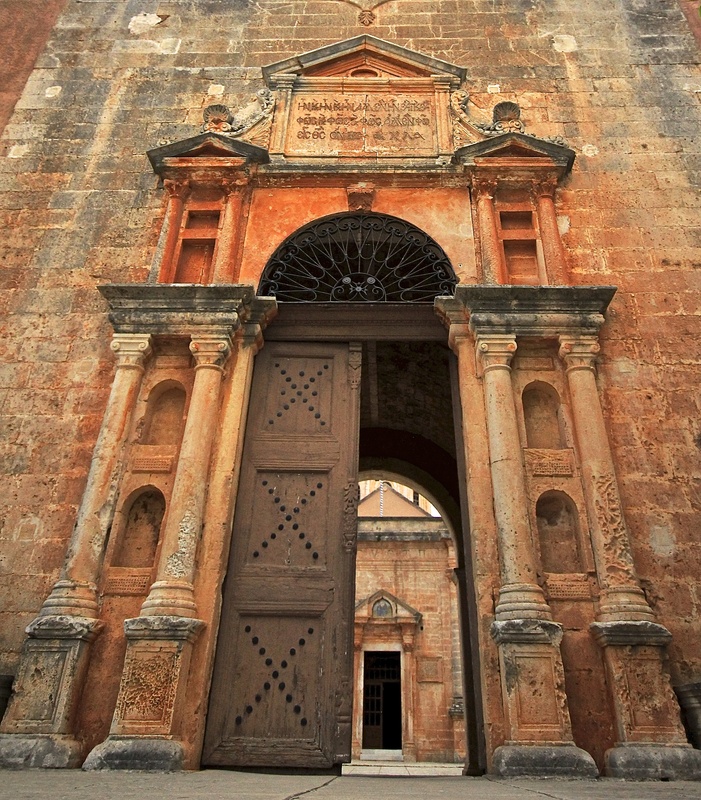 Inside the chapel was the epitome of extravagance – filled with gold embellishment. So contradictory and thats a part of the reason why I enjoyed it: I love a good contradiction. 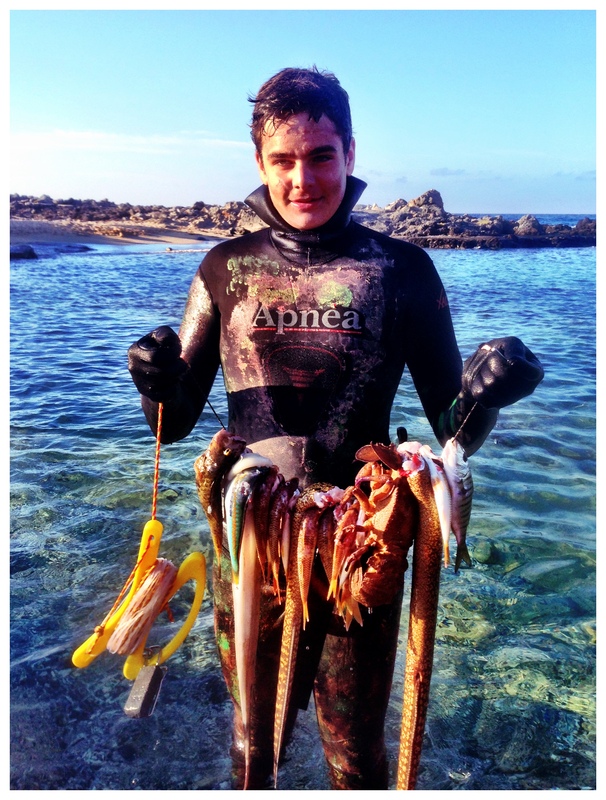 … but sometimes it rains – even in Crete! 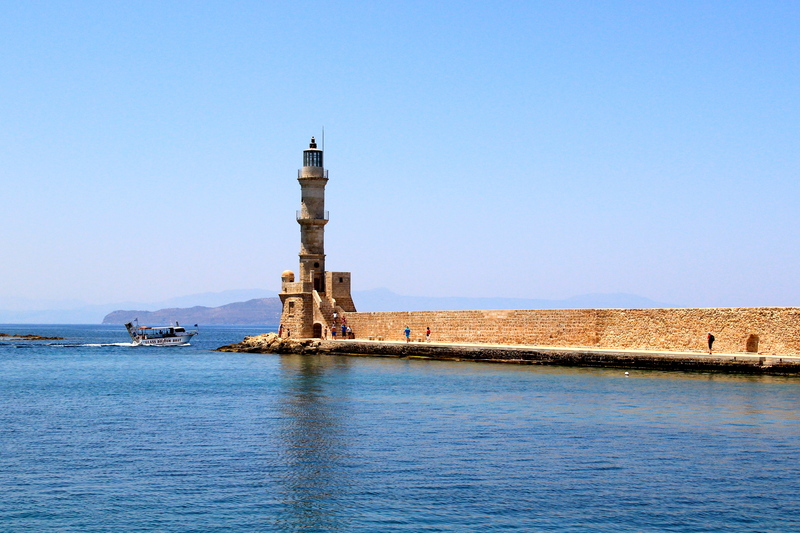 We also visited Chania (“Han-yaa”) this week. We (and when I say “we” I actually me “I”) went in search of Octopus. I know – it’s an odd purpose, but you see I had read somewhere that you can find Octopus’ hanging out to dry in the port – and I reeeally I wanted this as a photo for my collection. 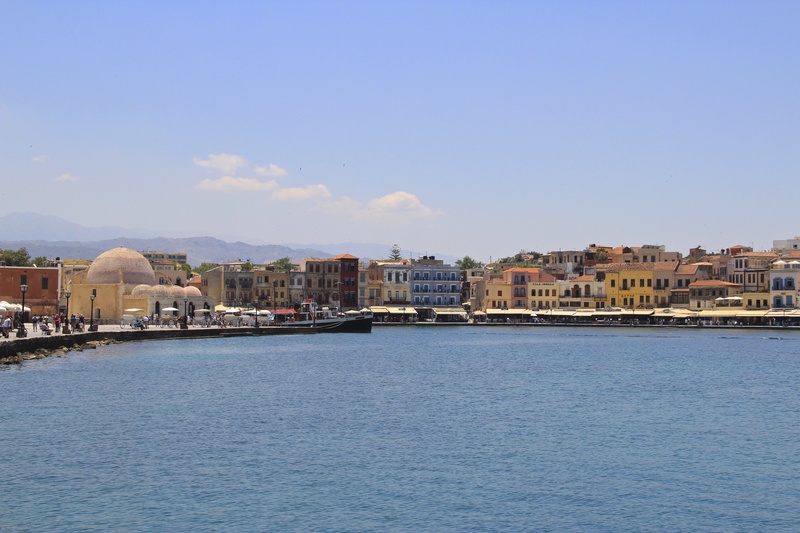 So we hunted high and low, Venetian Port, Old Port – we walked from one end of Chania to the other… and not a single octopus hanging out to dry. The best I could find was octopus on the menu. 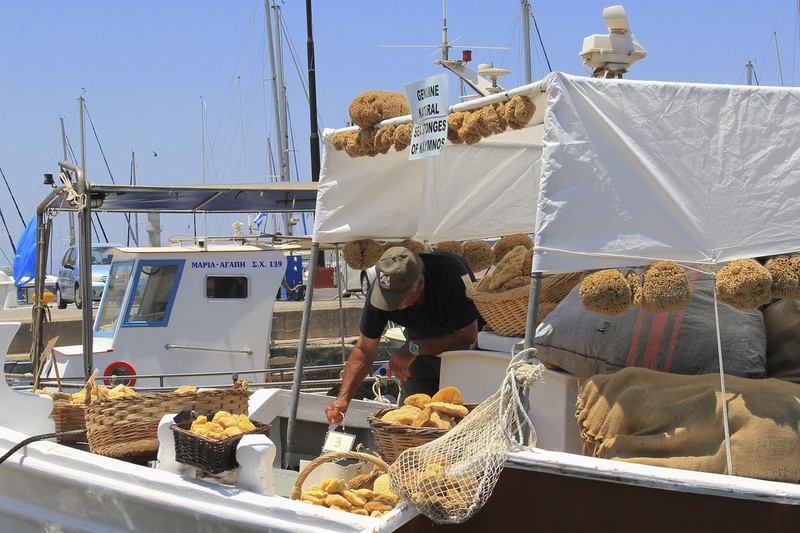 Alas – it was not meant to be but my dampened spirits were lifted when I found a man on a boat tending to and selling his genuine sea-sponges. It was here I took one of my favourite shots of the day. After a few sneaky snaps (to get him in action as he was washing the sponges out) I found myself wanting to touch the super-squishy looking sponges – but as ‘mostlyhubby’ says… “you touch it… you’ve bought it”. I didn’t touch it. Chania Old Town is adorable – I gather it was developed (like most of the ports in Crete) when it was occupied by the Venetians – and it feels that way too – both ‘The Old Port’ and ‘ The Venetian Port’ are long and sprawling and virtually merge into one another and are protected by the sea defence with a lighthouse at the end. 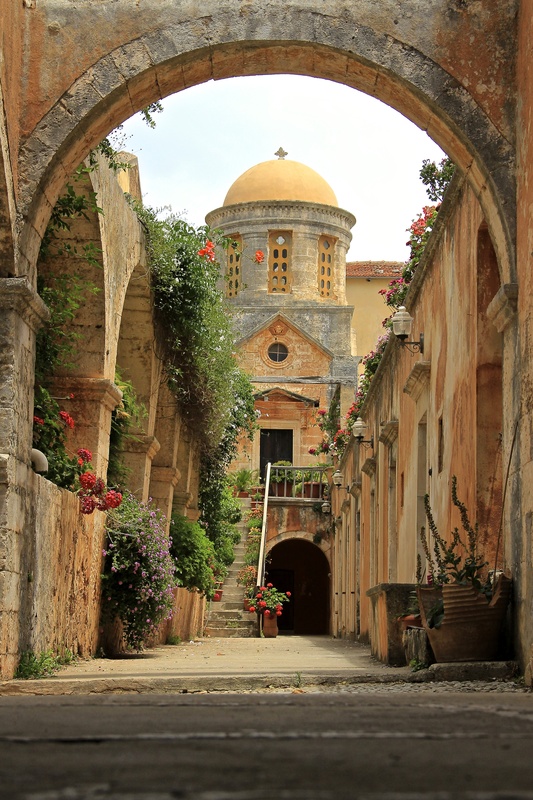 I could have wandered the backstreets of Chania old-town all day… with the windy little alleys leading you back and forth, up steps, down slopes – it’s easy to lose your orientation. Well.. I confess, I do have a pretty poor sense of direction (unless I have a map). 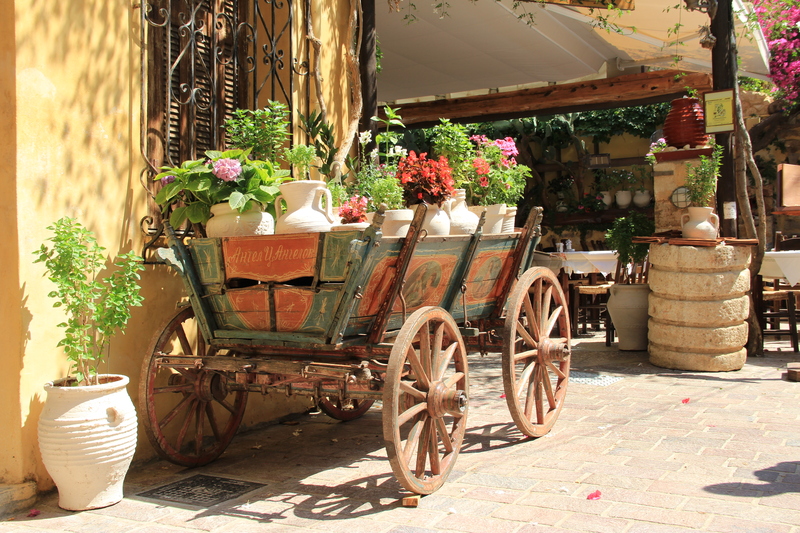 There’s oodles of quaint little shops, all needs are catered for, from boutiques to traditional wares, there’s dinky little cafe’s and tavernas & of course some cheesy tourist stores too. Many shops are so teeny-tiny that you have to turn on a sixpence & of course mind your day-pack doesn’t take out a bunch of expensive breakables as you do! 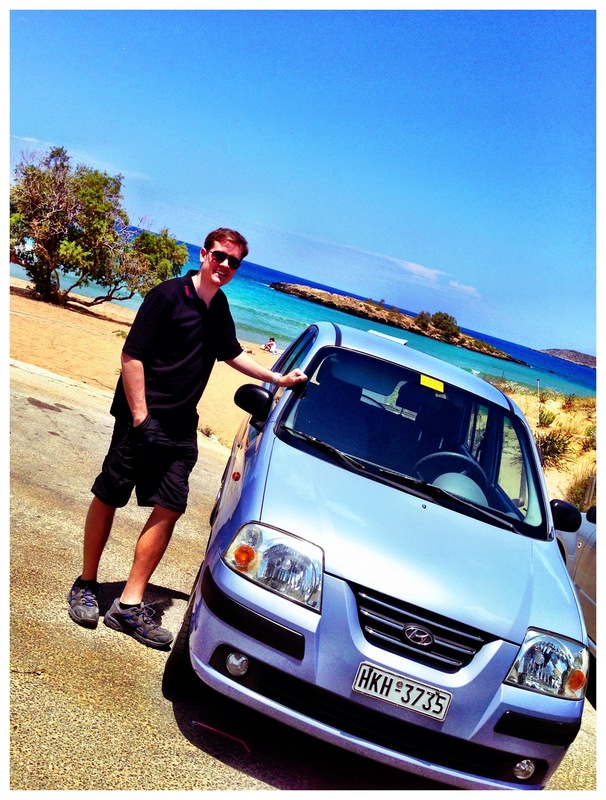 Today we took a mini-roadtrip across the island and have arrived in the city of Heraklion, where we drop off our wheels. 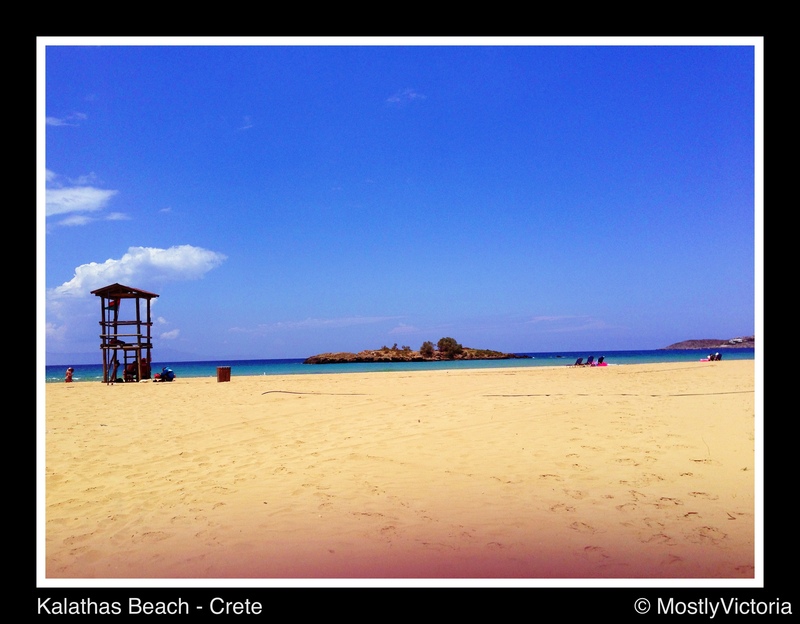 *MVnote – Crete is waaay bigger than I had appreciated before we arrived. It took us almost 3 hours (with breaks) to make our way barely halfway across this island. Tomorrow we catch the ferry to our very beloved Santorini… I cannot wait to return, it captured my heart on our honeymoon several years back. I hope it hasn’t changed; that it remains as romantic and captivating as it was before.